Groups of 3-4 players wander through the city playing Bocce. Location based goals and secret challenges provide a twist to the classic game. 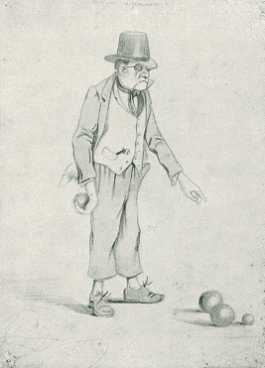 Having thrown the jack, the player then throws the first of their two bocce balls. During this process, they can specify that all other players must mimic their own style. For instance, if they do a twirl or a somersault while throwing, so must all other player. This can even be extended to more complex actions, such as sitting at a caf� having a drink, or asking a stranger for directions. 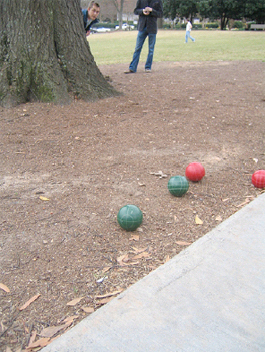 Any object in the city can be used to assist in placing the bocce ball close to the jack, provided no damage is done. Losing a ball is a permanent loss to the player, losing the jack is the immediate loss of the game. After all balls have been thrown, two points are awarded to the player with the ball closest the jack. The ball second closest to the jack earns one point. Additionally, the players can collectively award a point to a player for style and finesse, given that the player committed an awesome performance during their play. The game is played for as many rounds as it takes to reach twelve points.